We are a leading Manufacturer of wet mix macadam and automatic wet mix macadam plant from Mehsana, India. Being a famed company of the industry, we are betrothed in offering the best in class Wet Mix Macadam. This macadam produces high-quality mix. Vibrating screen single-deck vibrating screen is provided on the slinger conveyor to remove oversize aggregates received from the 4-bin feeder. They have a slinger conveyor inclined conveyor with 600 mm wide belt mounted on idlers receives aggregate from the gathering conveyor and feeds it to the pug mill. Furthermore, clients can get this macadam from us at industry leading prices. 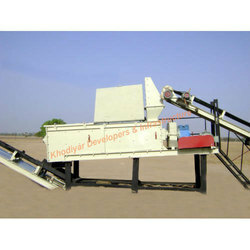 Our organization is famous in the industry for providing a commendable array of Automatic Wet Mix Macadam Plant. The offered plant has pug mills twin shaft pug mill mounted on anti-friction bearing which provides a quick, continuous and homogeneous mix of aggregates and additives. Moreover, at each bin, a radial gate is provided which can be opened in any position to regulate the aggregate flow. Along with this, individual endless belts are provided, below the gates to discharge material onto the gathering belt. Offered plants are available in different specifications as per the needs of customers. Water tankone / two water tanks of 15 / 20 mt capacity each are provided, fabricated from steel plates with manhole, flow meter, pump, etc.